There is a decent case to be made that the United States is overextended in the world, or that the United States should not be, as the simpleminded phrase has it, the “world’s policeman.” Even short of that view, we often overestimate our capacities for intervening and controlling events in chaotic places like Libya. I thought Obama was actually correct to stay out of Syria, though if so he should have kept his mouth shut about “red lines,” and a couple of well-placed MOABs on Bashir Assad’s favorite palaces were certainly in order. Our current and recent commitments have been extremely costly in both blood and treasure, and it is an immutable fact that the American people do not like long military engagements. Any president contemplating what to do overseas has to keep that in mind when he forms strategy and makes commitments. From a certain point of view Obama’s desire to reduce America’s role or responsibilities is not per se objectionable. Rand Paul, it should be noted, embraces the same idea, and for some of the same reasons. But to realign the world order so as to reduce American responsibility (and costs) requires a serious and long-term grand strategy to replace the United States as the essential pillar of the world order. It requires someone of the genius of the men who helped Harry Truman knit together the NATO alliance and our Cold War doctrines in the 1940s, or of the capacities of Nixon and Kissinger when they inherited the Vietnam mess and the decayed foreign policy consensus of the late 1960s. It would require the formation of new alliances and regional counterweights to step in forcefully where America no longer wishes to commit. It would require some harsh measures on our part to make certain countries assume more responsibility for policing their neighborhood. It would require making a lot of reluctant countries assume responsibilities they’d rather just slough off to us. It would take a decade or longer for such realignments to take shape and have effect. Ceasing to be “the world’s policeman” will not mean that the world won’t need policing. Does anyone think Obama or anyone around him is of this far-sighted caliber, or even thinking this way? Hillary Clinton? John Kerry? Valerie Jarrett? Samantha Power? This crew makes Zbigniew Brzezinski and Cy Vance look like Metternich, Castlereagh and Talleyrand by comparison. Obama proceeds from the leftist assumption that America is the cause of the world’s problems, and that if we withdraw from the world things will improve because all these Third Worlders are so much better than we let them be. Call it foreign policy by guilt. To the extent Obama has a strategy at all, it is to appease Iran, or possibly his own kind of “Nixon-to-China” moment, i.e., “Only Obama can go to Iran.” He doesn’t seem to realize that no American can go to Iran. The opening to China worked because we knew that China viewed the Soviet Union as its main adversary in the world, and as such there was something in it for them as well as us. But Iran regards the United States as its chief enemy, and none of Obama’s smooth talking will change that. Rand Paul proceeds from the formulaic and doctrinaire libertarian assumption that all we need to promote peace and prosperity in the world is lots and lots of free trade. 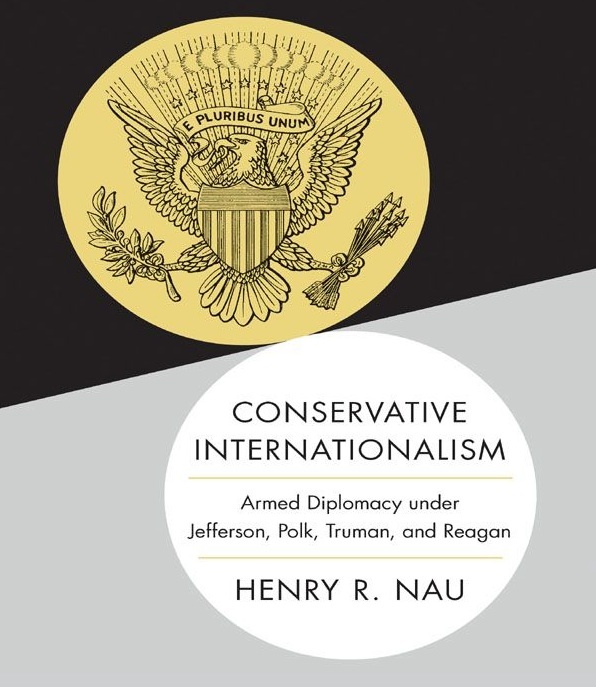 Obama is a lost cause obviously, but Rand Paul and every other potential Republican candidate for 2016 ought to read Henry Nau’s book Conservative Internationalism: Armed Diplomacy Under Jefferson, Polk, Truman and Reagan. I think Nau lays out precisely how you’d go about forming a grand strategy along the lines suggested above. Today in foreign policy literature and public discourse, conservative internationalism does not exist. Liberal thinking dominates the internationalist tradition, and conservative thinking has been classified historically as either nationalist or realist. More recently, liberal critics have tried to conflate conservative foreign policy with neoconservatives (neocons) and George W. Bush. But important tenets of conservative internationalism, such as small government, limited priorities, and armed diplomacy to achieve timely compromise, not unconditional surrender, are not synonymous with neoconservatism; and despite his liberal internationalist rhetoric, George W. Bush has the instincts of a nationalist and realist, not a neocon. His freedom agenda did not exist before the 9/11 attacks, and that agenda was undermined after 9/11 chiefly by his nationalist focus on victory and realist aversion to nation-building.